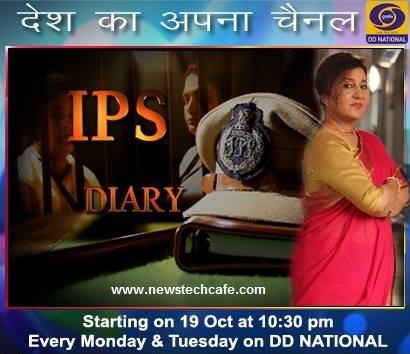 Doordarshan, which launched its new look in August, will come up with new shows “IPS Diary”. By this new show, they are planning to regain the viewership of Doordarshan. Kavita Choudhary is playing a retired cop. It features an adaptation of true cases picked up from the diary of an IPS officer. The show will go on air from 19 ,October ,2015 at the time slot of 10:30pm. The stories inspired by true incidents shall be woven around crime and would feature Kavita Chaudhry analysing the cases and creating awareness in how to handle situations that demand alertness and a brave front. By stating real and true examples, Kavita Chaudhry will encourage the masses to become a fighter and stand up against the culprits who are one of us only but different as their intentions are evil and they are a scar on the society! Not only will Kavita Chaudhry show ways and means but will also share with the viewer, facilities available by the Government to fight crime. There will be direct connect with the viewer to make them feel safe and secure. Kavita Chaudhry is playing lead role in this serial. She was well known for her character in DD's 'Udaan' Serial. I feel, crime shows are cinematically better than other shows. I asked my producer whether it will scare the audience but he told me that it will not only make people aware but also empower and entertain,” Kavita said.